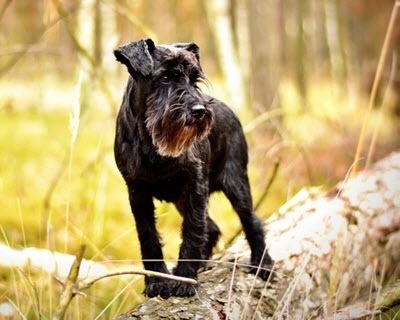 The Miniature Schnauzer was developed in Germany as a small but brave farm dog. The earliest records of Miniature Schnauzers date back to the 19th century when the breed was used by farmers to hunt rats in the barn and guard herds, farms and families. 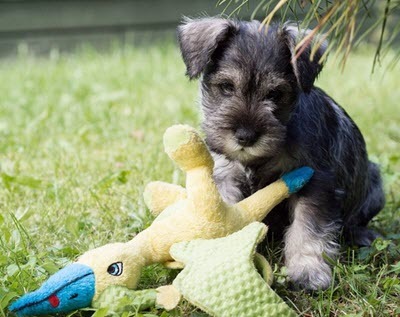 The Miniature Schnauzer was developed in a successful effort to bring down the size of the Standard Schnauzer by crossing it with small dogs such as Affenpinshers, Miniature Pinschers and Poodles. The miniature Schnauzer dog has a wiry coat and brushing or combing your dog on a daily basis is an important part of proper Miniature Schnauzer dog care. If you do not devote enough time to coat maintenance, the coat can become matted. Even with proper coat care, it is common for this type of coat to form knots that must be removed using a pair of scissors. The whiskers need to be cleaned after each meal, and you may also need to trim around the eyes and ears of this breed once in a while. Daily Miniature Schnauzer dog care is something that you can take care of yourself, but twice a year you should bring your dog to a professional dog clipper – once in fall and once in spring. Unfortunately, this breed is prone to schnauzer comedone syndrome – “Schnauzer Bumps”. Dogs suffering from this problem develop pus filled bumps, normally located on the back of the Schnauzer. This is an inherited condition and there is no known cure; the condition will be present throughout the dog’s entire life. An essential part of good Miniature Schnauzer dog care is naturally to help your dog if it develops this problem. The first time the bumps manifests, it is advisable to seek veterinary attention. Unless your vet states otherwise, future problems might be lessened by using a dandruff shampoo suitable for canines and bathing your Schnauzer on a regular basis without drying out the skin. Keep your dog in a stripped coat or clipped very short and use vitamin E on a daily basis. Some keepers have reported that their dogs get better when kept on a corn-free diet, so the problem might be related to some type of food allergy – at least for some dogs. Some dogs will also get better when exposed to sunshine. The Miniature Schnauzer is one of the most popular dogs in the United States as well as in many other countries, but before you go out and buy a Miniature Schnauzer dog puppy you should always ask yourself if you will be able and willing to care for a dog for the next 12-14 years. Will you be able to devote sufficient amounts of time, money and energy to this new member of your family? The fact that you live in a city apartment should not deter you from getting a Miniature Schnauzer dog puppy, since this breed can have a great life in an apartment as long as it is provided with frequent walks and a lot of outdoor playtime. The Miniature Schnauzer dog is a lively and playful creature with tons or energy, and if it is not given a proper outlet for all this oomph it can turn into an unhappy and problematic dog. Schnauzers that are not given ample amounts of exercise are naturally also prone to obesity. Do not get a Miniature Schnauzer dog puppy unless you know for certain that you will be willing to provide the adult dog with long, brisk walks every day. If you live close to a park or similar it will be even better, because the Miniature Schnauzer dog loves to play off leash. The Miniature Schnauzer will require daily coat care and will also need two visits to a professional dog clipper each year. If you do not have enough time and money for this, getting a Miniature Schnauzer dog puppy is not a good idea. During Miniature Schnauzer dog training, it is important to act confident and be consistent. If you let your dog sleep on the sofa some days and punish it for the same behaviour other days, it will only end up confused and miserable. The same is true if you give your Miniature Schnauzer vague commands. Dogs prefer when things are clear and consistent. The Miniature Schnauzer is especially stubborn and the key to successful Miniature Schnauzer dog training is therefore to be even more stubborn. Another important thing to keep in mind is that repetition tends to bore the schnauzer and make it less prone to learning new things. Vary your training sessions and turn them into happy and playful events. A very important aspect of Miniature Schnauzer dog training is to control when and why your dog barks. Being bred as a brave and vigilant guarding dog that protected herds, farms and families, the Miniature Schnauzer is a very vocal dog. Its natural instinct is to warn you as soon as any stranger ventures close to your home. The Miniature Schnauzer will normally not stop barking until its owner welcomes the guest and let the dog know that everything is okay. As soon as a newcomer has been “approved” by the dog owner, the Miniature Schnauzer will normally become extremely friendly towards that person. If you do not want your dog to bark every time someone walks past your garden, you must teach it this. The Miniature Schnauzer cannot read your mind – it believes that it is fulfilling its job and protecting its human family by warning you of all the suspicious strangers. If you devote some time and energy to proper Miniature Schnauzer dog training, you can control when and why your dog barks. You can for instance teach you dog to bark only if someone actually enters your garden. According to the AKC (American Kennel Club) standards, the aim of Miniature Schnauzer dog breeding should be to develop friendly and intelligent dogs that are willing to please. The ideal Miniature Schnauzer is alert and feisty, yet highly obedient to its trainer. Overaggressive behaviour as well as timorousness is considered a fault. When it comes to general appearance, the AKC standard states that the aim of Miniature Schnauzer dog breeding should be the creation of robust dogs that resembles the bigger Standard Schnauzer. The size of the Miniature Schnauzer should be between 12 and 14 inches and the dog should be almost square in proportion of body length to height. The tail must be set high and carried in an erect fashion. In the United States, there are three recognized colour variations: solid black, black and silver, and salt and pepper. Regardless of colour, the coat should always be double and consist of a hard and wiry outer coat that is combined with a close undercoat. When you try to choose between the various Miniature Schnauzer dog breeders, it is important to stay clear of puppy mills and other types of insincere breeders. Even a true dog lover can do the breed disservice if he or she decides to let her dogs breed without first getting to know their genetic heritage. Serious breeders will always investigate the health status of the dogs they are planning to use as parents in order to remove dangerous hereditary problems form the breed. The Miniature Schnauzer breed is today plagued by diabetes, bladder stones and pancreatitis. These dogs can also be genetically disposed to ideopathic hyperlipidemia, a condition that increases the risk of developing pancreatitis. The risk becomes even greater if you feed your dog sweet or fatty foods. As mention above, “Schnauzer Bumps” is another common health problem for the Miniature Schnauzer. It is hard to give any general guidelines regarding the “normal” Miniature Schnauzer dog price, since it varies a lot between different Miniature Schnauzer dog breeders and regions. The important thing is to investigate what you actually get for your money. Sometimes the Miniature Schnauzer dog price will be high because the breeder has invested a lot of money in obtaining healthy parents, creating a good home for the dogs, provided both parents and puppies with extensive veterinary attention and so on, but in other cases the Miniature Schnauzer dog price is high simply because the seller is the greedy owner of a Miniature Schnauzer puppy mill that tries to bring in as much money as quickly as possible. The estimated life span for a healthy and well cared for Miniature Schnauzer is 12 to 14 years, so trying to save a few bucks on the purchase price by going to a puppy mill is not worth it if you consider how long you will be able to enjoy a healthy, well socialized Miniature Schnauzer. Getting a sick dog will not only be painful for the dog and you; the vet bills will certainly be painful for your piggy bank too.